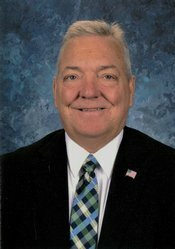 Mr. Richins is in his sixth year as Superintendent at West Jefferson. Mr. Richins graduated from West Jefferson High School in 1978. He has 34 years of education experience in Idaho schools. Mr. Richins graduated from Idaho State University in 1985 with a BS in Secondary Education, with a Science Major and Math Minor. In 1998 Mr. Richins received his MA from ISU in Ed Administration. In 2013 Mr. Richins received his Ed Specialist from ISU. Mr. Richins has been a Math teacher, Science teacher, Athletic Director, Assistant HS Principal, Head Football Coach, Head Track Coach, and Head Girls Basketball Coach during his career. He and his wife Allyson have 4 children and 13 grandchildren. Mr. Richins is also a retired Lt Colonel from the Army Reserves/National Guard and a Veteran from Operation Enduring Freedom (Afghanistan). Mr. Richins said" West Jefferson is a great place to go to school. We have a very dedicated and professional staff who loves kids. I have some of my greatest memories here at West Jefferson. The people are very supportive of their schools and children. I am very blessed to have this opportunity to come full circle and return to West Jefferson"!